Fondue has its origins in different countries. It gets its name from the French word "fondre", which means "to melt". In the 18th century in Switzerland, cheese fondue was started as a way of using stale bread and aged cheese in winter months. This was a time when fresh foods were not readily available. Meat fondue originated in France during the middle ages, when vineyard workers used hot oil to cook meat during their breaks. Broth-style fondue was first used in China, where this lighter method was used to dip food in order to cook it. The chocolate fondue is credited to America in the mid-20th century. This traditional way of cooking remains strong today. The Cuisinart Cast Iron Fondue is perfect for this style of cooking. What Is a Fondue Pot? Fondue is a dish where people dip bread, meat, seafood, fruit or other foods into a pot containing melted cheese, hot oil, broth or chocolate. In the case of a meat fondue, it cooks in the pot. The cheese variety is the most traditional. The pot is heated over a flame which is usually generated by a gel or alcohol-based fuel. This ensures the sauce or oil inside the pot stays melted and warm. You can buy modern electric versions as well. When you buy a fondue pot, make sure it is compatible with your intended use. Some are better for cheese and chocolate, while others are better for oils and broths. 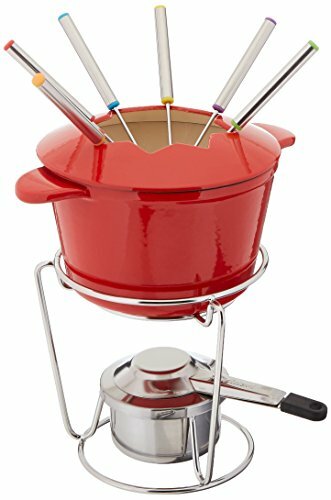 This stylish fondue pot is made from cast iron and has an enamel finish. It is available in red or white, depending on your preference, or what matches your decor. The stand and burner are made from stainless steel. The fondue pot measures 7 by 7.2 by 13 inches and weighs 6.8 pounds. The cast-iron pot can be used on all stove tops to prepare your fondue. It is suitable for cheese, broth or chocolate sauces. The construction ensures even heating, and the heat retention is optimized by the cast iron. It will keep the temperature consistent. The capacity of the fondue pot is 6 cups, filled to the brim. Ideally, during use, 4-5 cups would be a maximum. Six color-coded forks are supplied with the set, making it easy for each person to identify his or her utensil. This is perfect when you are entertaining guests and don't want any mix-ups. This pot is versatile for transferring your fondue to the burner. This could be to a dining table, coffee table or outdoors. The burner comprises a fuel container and lid. It can be used with chafing gel, alcohol or a standard 2.6-ounce fuel container for cooking. The fuel is not included with this set but needs to be purchased separately. This traditional-style fondue set is classic in design and appearance. Customers love the versatility it offers them. It can be placed anywhere for serving without having to worry about electrical wires. The enamel coating on the cast-iron pot makes cleaning easy and quick. It can even be placed in a dishwasher. The quality of this set is above average for the price. The cast-iron pot distributes and retains heat well—keeping your cheese, broth, or chocolate warm for as long as you need it. The amount of heat provided by the burner can be adjusted. The forks that come with the set are of a good quality. They are long enough to be dipped in the pot without the risk of burning your hand. On the downside, some people reported that the enamel coating was chipped, although I didn’t have this issue. There are also mixed reports about the stability of the stand for the fondue pot. I found it to be sturdy and safe, but there were reports from others that it wobbles and is not strong enough. Perhaps the design is a little top-heavy. If you’re worried about that, this Trudeau model is a little more squat. Fondue is a very sociable way to share food with friends. The Cuisinart FP-115RS is a good example of a traditional fondue set. The cast-iron pot can be used to prepare your fondue on the stove, and then transferred to the stand and burner to retain the heat. While we don’t have to face the challenges that initiated the cooking of food in this way, it is an enjoyable and fun way to entertain. If you’re thinking of buying a fondue set and don’t want an electric model with cords attached, this is a good option. You can use it on your dining table, coffee table, kitchen island—or even outdoors.